Ask questions about your life, birth chart, and karmic journey. You will learn to view yourself in an entirely new light even if you are familiar with evolutionary astrology. The wisdom about soul and our many human lives that comes from Archangel Metatron, Ascended Master Djehuty (a.k.a. Thoth, St. Germain, and Merlin) and the departed spirits I’ve worked with and learned from seriously enriches how I practice evolutionary astrology. Topics can include life purpose, work/career, family issues past and present, money/abundance issues, how to work through challenging times including past/present trauma and abuse, and just about anything else. Energy work is available, most effective during intuitive coaching packages of 3 and 6 hours–see the next section on this page for more on that. Read a PDF about energy work with me. PayPal links are below. If you prefer using a credit card or a check, contact me at (213) 925-6019 or tom@tdjacobs.com for the mailing address for a check or to provide your card number. Prerecorded MP3 – email me up to 400 words on what you’d like me to cover. 60-minute prerecorded MP3 using one chart for $145. Purchase. 60-minute prerecorded MP3 life overview reading for a child, $135. Purchase. 30-minute prerecorded MP3 using one chart for $65. Purchase. 60-minute prerecorded MP3 using two charts (relationship reading) for $195. Purchase. 60-minute live reading using one chart for $165. Purchase. 30-minute live reading using one chart for $85. Purchase. 60-minute live reading using two charts (relationship reading) for $215. Purchase. If you use multiple email addresses (i.e., one for PayPal but you don’t check that one often), check it for communication from me. I reply to the email addresses on PayPal receipts and it’s incumbent on you to check it for details about your session(s). These sessions take place over the phone/web conference or in person in the Portland, OR area. Note: For those not in Portland, I use Zoom. I do not use Skype. To see my availability, click on this link. Times through mid-April are now posted. Important: Do not schedule a time using the link without paying first. Only use this link after you have paid for a session. This is a 20-minute prerecord exploration of your multilife/karmic journey. It covers Pluto, the South Node of the Moon, the South Node ruler by sign, and the North Node – all by house, sign, and aspect – and all from an evolutionary, soul-based approach. I’ll cover the major life themes your soul has you working on in many lifetimes. When you understand what your soul intends for you through your experiences and relationships, you can begin to make peace and become empowered to learn to make new choices. In each I offer remedies and tools to help you shift what’s happening, in case you’re replaying old karma that doesn’t feel good (as many or most of us do by default). They’re full of insights into how to use energies in your chart intentionally so that you can stop the unconscious vibrations that create what you don’t like. Nothing need be static. Nothing need stay the same. Because karma is a collection of beliefs, all karma can be changed. But we each must to learn to step into empowerment and see how we can make better and more conscious, intentional choices. 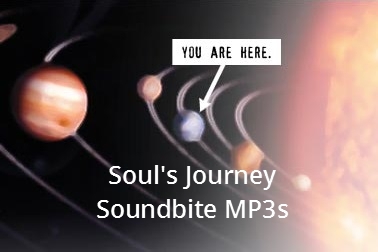 A Soul’s Journey Soundbite is a great first step! Read (PDF) what people have to say about their Soundbites. Many have used these readings to sample my approach and energy, and then book full consultations to work on specific issues with some depth. Many listen again and again, as these readings are chock full of important information about their lives. As I cover the major themes, these readings are useful for decades. Details: Only AFTER ordering using the above link, enter your full birth data in the form below (it’s okay if you don’t have a time of birth). If you enter your birth data without ordering using the link above or contacting me for another form of payment, you are not in the queue. Since this reading follows a 4-step structure, I do not answer questions in them. Use the consultation options below instead if you have questions you want me to answer. Allow 14 days for delivery. If you do not hear from me within 14 days (whether confirming your order or receiving the Soundbite mp3 itself), this is normal due to the number of kinds of work I manage and all the related emails. If you do not hear from me on day 15 after you place your order, feel free to write and inquire. I’ve been doing mediumship since 2005, and have offered it as a regular service off and on. It’s close to my heart due to the powerful, heart-centered resolutions it enables, helping us move on from loss to live fully and with presence. It’s been a while since I’ve offered it because it involves different prep, different levels of consciousness during the sessions, and there are different effects on me and in my life (such as not being able to do practical/admin work for hours afterward, if not the rest of the day). Now I’ve developed a number of books and teachings that are reaching people and can shift my focus, and am being strongly guided to offer this work again. Important: My focus with mediumship is on the living client’s resolution with the deceased. This is heart-centered work to help you understand the soul-level agreements your soul and that of the deceased have together, and make peace with the human expressions of those agreements. Understand that sometimes the deceased person you’d like resolution with doesn’t come through. In those cases, understand that your spirit guides and my team will still perform a healing for you, helping you see the point of the relationship, revealing the soul-level contracts, and supporting you in seeing and accepting a higher truth about why that person was with you in the way he or she was. When you can see the bigger picture, it’s easier to begin to let go and release the other into his or her next phase. If needed, this work also includes helping the spirit of your loved one cross over when the time is right. I offer mediumship sessions that last between 60 and 70 minutes for $185. Purchase one through PayPal or be in touch to arrange for another form of payment. I will provide you with an audio recording after the session. To see my availability, click on this link. Times through mid-March are now posted. Important: Do not schedule a time using the link without paying first. Only use this link after you have paid for a session. Your most difficult issues are karmic and they persist in many lives. The only way to move beyond them is to gain a view on your karma and learn how to release and change it. You can opt for talking astrology/counseling or energy work (read about energy work with me in this PDF), or a mix. Examples include long-time, persistent, deep patterns in love relationships, work/career issues, family difficulties, sexual issues, self-esteem, motivation, confusion over life purpose … or anything else. My intention is to support you in healing, as well as to teach you to see your life as your guides, the ascended masters, angels, and your higher self/soul see it. I bring through the consciousness level of Djehuty, the ascended master, and Metatron, the archangel. Their perspectives ground you in a high level of consciousness so that you can make changes where they need to be made. Choose 30-minute or 60-minute sessions. There is no set duration of weeks of coaching but I encourage you to work with me for at least 6 consecutive weeks to see meaningful results. Some coaching clients work with me for a year or two and others for a few months at a time here and there. I will record your sessions and e-mail you a link to the mp3. Coaching hours are purchased in packages of 3 ($125/hour; to be used within 2 months) or 6 ($115/hour; to be used within 4 months). I accept credit cards, PayPal, and checks for payment. The mailing address if you prefer sending a check: Tom Jacobs, 9545 SW 146th Terrace #8, Beaverton OR 97007. Call me to provide a card number–do not leave it on voicemail or send it via email. Email if you have questions not answered here or to discuss if coaching is right for you. To see my availability, click on this link. Times through mid-May are now posted. Important: Do not schedule a time using the link without paying first. Only use this link after you have paid for a package of sessions. Coaching package: 3 hours of intuitive coaching sessions for $375 ($125/hour). Purchase. Coaching package: 6 hours of intuitive coaching sessions for $690 ($115/hour). Purchase.